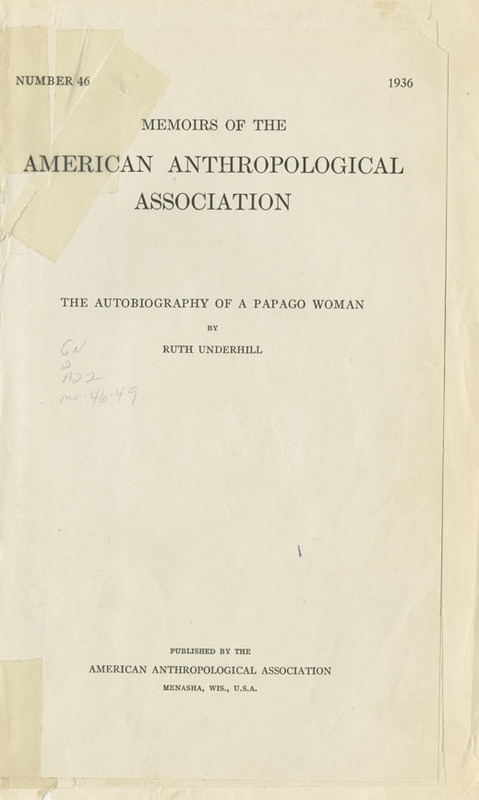 Underhill, Ruth & Chona, Maria , “The Autobiography of a Papago Woman ,” Arizona 100: Essential Books for the Centennial, accessed April 21, 2019, http://speccoll.library.arizona.edu/online-exhibits-dynamic/az100/items/show/209. Chona, the daughter of a Papago (Tohono O’odham) village chief when the tribe first came under American supervision, was in her nineties when Underhill (1884-1984) recorded her recollections during several visits between 1931 and 1935. She recalls her childhood in conditions that differed very little from Spanish days, her marriage to a medicine man, and her own life as a healer. The first published memoirs of a southwestern Native American woman, Chona’s recollections are valuable for their descriptions of Tohono O’odam ceremonies, religious rites, and living conditions in the nineteenth century. Menasha, Wisc. 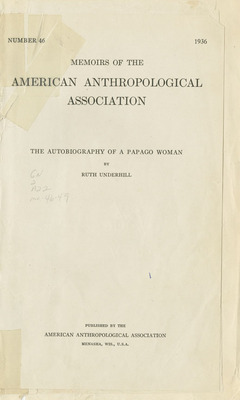 : American Anthropological Association, 1936. 1 p. ℓ., 64 p. ; 24 cm.